A chemical element can be defined in one of two ways: experimentally or theoretically. Experimentally, an element is any substance that cannot be broken down into any simpler substance. Imagine that you are given a piece of pure iron and asked to break it down using any device or method ever invented by chemists. Nothing you can do will ever change the iron into anything simpler. Iron, therefore, is an element. The experimental definition of an element can be explained by using a second definition: an element is a substance in which all atoms are of the same kind. If there were a way to look at each of the individual atoms in the bar of pure iron mentioned above, they would all be the same—all atoms of iron. In contrast, a chemical compound, such as iron oxide, always contains at least two different kinds of atoms, in this case, atoms of iron and atoms of oxygen. Atomic mass: The mass of the protons, neutrons, and electrons that make up an atom. Atomic number: The number of protons in the nucleus of an element's atom. Chemical symbol: A letter or pair of letters that represents some given amount of an element. Compound, chemical: A substance that consists of two or more chemical elements joined to each other in a specific proportion. Metal: An element that loses electrons in chemical reactions with other elements. Metalloid: An element that acts sometimes like a metal and sometimes like a nonmetal. Nonmetal: An element that tends to gain electrons in chemical reactions with other elements. Periodic table: A system of classifying the chemical elements according to their atomic number. Synthetic element: An element that is made artificially in a laboratory but is generally not found in nature. Ninety-two chemical elements occur naturally on Earth. The others have been made synthetically or artificially in a laboratory. Synthetic elements are usually produced in particle accelerators (devices used to increase the velocity of subatomic particles such as electrons and protons) or nuclear reactors (devices used to control the energy released by nuclear reactions). The first synthetic element to be produced was technetium, discovered in 1937 by Italian American physicist Emilio Segrè (1905–1989) and his colleague C. Perrier. Except for technetium and promethium, all synthetic elements have larger nuclei than uranium. *If no number is entered, the element constitutes less than 0.1 percent. At the beginning of the twenty-first century, there were 114 known elements, ranging from hydrogen (H), whose atoms have only one electron, to the as-yet unnamed element whose atoms contain 114 electrons. New elements are difficult to produce. Only a few atoms can be made at a time, and it usually takes years before scientists agree on who discovered what and when. More than 100 years ago, chemists began searching for ways to organize the chemical elements. At first, they tried listing them by the size (mass) of their nucleus, their atomic mass. Later, they found that using the number of protons in their atomic nuclei was a more effective technique. They invented a property known as atomic number for this organization. The atomic number of an element is defined as the number of protons in the nucleus of an atom of that element. Hydrogen has an atomic number of 1, for example, because the nuclei of hydrogen atoms each contain one—and only one—proton. Similarly, oxygen has an atomic number of 8 because the nuclei of all oxygen atoms contain 8 protons. The accompanying table (periodic table of the elements) contains a list of the known chemical elements arranged in order according to their atomic number. 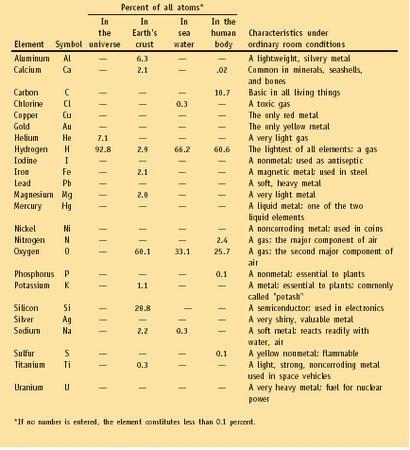 Notice that the chemical symbol for each element is also included in the table. The chemical symbol of an element is a letter or pair of letters that stands for some given amount of the element, for example, for one atom of the element. Thus, the symbol Ca stands for one atom of calcium, and the symbol W stands for one atom of tungsten. Chemical symbols, therefore, are not really abbreviations. Chemical elements can be fully identified, therefore, by any one of three characteristics: their name, their chemical symbol, or their atomic number. If you know any one of these identifiers, you immediately know the other two. Saying "Na" to a chemist immediately tells that person that you are referring to sodium, element #11. Similarly, if you say "element 19," the chemist knows that you're referring to potassium, known by the symbol K.
The system of classifying elements used by chemists today is called the periodic table. The law on which the periodic table is based was first discovered almost simultaneously by German chemist Julius Lothar Meyer (1830–1895) and Russian chemist Dmitry Mendeleev (1834–1907) in about 1870. The periodic table is one of the most powerful tools in chemistry because it organizes the chemical elements in groups that have similar physical and chemical properties. One useful way of describing the chemical elements is according to their metallic or nonmetallic character. Most metals are hard with bright, shiny surfaces, often white or grey in color. Since important exceptions to this rule exist, metals are more properly defined according to the way they behave in chemical reactions. Metals, by this definition, are elements that lose electrons to other elements. By comparison, nonmetals are elements that gain electrons from other elements in chemical reactions. (They may be gases, liquids, or solids but seldom look like a metal.) 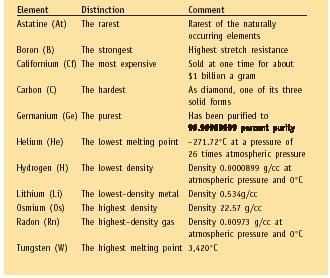 The vast majority (93) of the elements are metals; the rest are nonmetals. The concept of a chemical element goes back more than 2,000 years. Ancient Greek philosophers conceived of the idea that some materials are more fundamental, or basic, than others. They listed obviously important materials such as earth, air, fire, and water as possibly being such "elemental" materials. These speculations belonged in the category of philosophy, however, rather than science. The Greeks had no way of testing their ideas to confirm them. In fact, a few elements were already known long before the speculations of the Greek philosophers. No one at that time called these materials elements or thought of them as being different from the materials we call compounds today. Among the early elements used by humans were iron, copper, silver, tin, and lead. We know that early civilizations knew about and used these elements because of tools, weapons, and pieces of art that remain from the early periods of human history. Another group of elements was discovered by the alchemists, the semimystical scholars who contributed to the early development of chemistry. These elements include antimony, arsenic, bismuth, phosphorus, and zinc. How were the chemical elements formed? Scientists believe the answer to that question lies in the stars and in the processes by which stars are formed. The universe is thought to have been created at some moment in time 12 to 15 billion years ago. Prior to that moment, nothing other than energy is thought to have existed. But something occurred to transform that energy into an enormous explosion: the big bang. In the seconds following the big bang, matter began to form. According to the big bang theory, the simplest forms of matter to appear were protons and electrons. Some of these protons and electrons combined to form atoms of hydrogen. A hydrogen atom consists of one proton and one electron; it is the simplest atom that can exist. Slowly, over long periods of time, hydrogen atoms began to come together in regions of space forming dense clouds. The hydrogen in these clouds was pulled closer and closer together by gravitational forces. Eventually these clouds of hydrogen were dense enough to form stars. A star is simply a mass of matter that generates energy by nuclear reactions. The most common of these reactions involves the combination of four hydrogen atoms to make one helium atom. As soon as stars began to form, then, helium became the second element found in the universe. As stars grow older, they switch from hydrogen-to-helium nuclear reactions to other nuclear reactions. In another such reaction, helium atoms combine to form carbon atoms. Later carbon atoms combine to form oxygen, neon, sodium, and magnesium. Still later, neon and oxygen combine with each other to form magnesium. As these reactions continue, more and more of the chemical elements are formed. At some point, all stars die. The nuclear reactions on which they depend for their energy come to an end. In some cases, a star's death is dramatic. It may actually blow itself apart, like an atomic bomb. The elements of which the star was made are then spread throughout the universe. They remain in space until they are drawn into the core of other stars or other astronomical bodies, such as our own Earth. If this theory is correct, then the atoms of iron, silver, and oxygen you see around you every day actually started out life in the middle of a star billions of miles away. The modern definition of an element was first provided by English chemist Robert Boyle (1627–1691). Boyle defined elements as "certain primitive and simple, or perfectly unmingled bodies; which not being made of any other bodies, or of one another, are the ingredients of which all those call'd perfectly mixed bodies are immediately compounded, and into which they are ultimately resolved." For all practical purposes, Boyle's definition of an element has remained the standard working definition for a chemical element ever since. 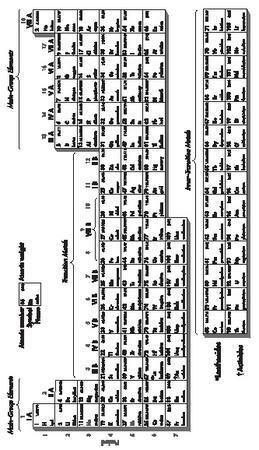 By the year 1800, no more than about 25 true elements had been discovered. During the next hundred years, however, that situation changed rapidly. By the end of the century, 80 elements were known. The rapid pace of discovery during the 1800s can be attributed to the development of chemistry as a science, to the improved tools of analysis available to chemists, and to the new predictive power provided by the periodic law of 1870. During the twentieth century, the last remaining handful of naturally occurring elements were discovered and the synthetic elements were first manufactured. It is very useful.I like this very much.This helps to know the basic ideas correctly. Explain how you know that no new element with an atomic number less than 100 will be discovered. Can u please go into more detail on how the nuclear reactions actually create a synthetic element? what is the difference between chemicals such as iron or magnrsium in and out of the human body? what are the elements and compounds found in plants and animals? Thank you for writing everything in such a clear manner. It really helped me understand.